St. Mary Basilica, formerly St. Mary's Cathedral, located in Natchez, Mississippi, United States, is a parish church in the Diocese of Jackson and Minor basilica of the Catholic Church. In 1979 it was listed under its former name as a contributing property in the Natchez On-Top-of-the-Hill Historic District on the National Register of Historic Places. 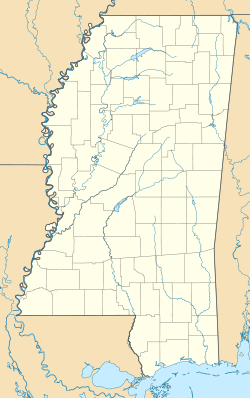 The Diocese of Natchez (now the Diocese of Jackson) was erected in 1837, and in 1842 construction began on a new cathedral. It was dedicated on December 25, 1843, but for the completed of the construction of the building, the diocese had to wait 40 years until 1882. The building was consecrated on September 19, 1886 and remained the cathedral of the diocese until 1977. It was designated a minor basilica on September 8, 1998 and dedicated as such on September 25, 1999. In 2007 the body of Bishop John J. Chanche, S.S. the first Catholic bishop of Mississippi, was exhumed from a Baltimore, Maryland catholic cemetery and returned to Natchez to be reinterred in St. Mary Basilica's church yard. The brick structure is two stories in height, and it was constructed on a partially raised basement. It features a semi-circular apsidal end, ornamental pinnacles, and buttresses. The central square tower that is capped with a spire is embedded into the structure, and it has a recessed Gothic-arched entrance. Local architect James Hardie designed the Gothic Revival building. ^ a b Mary Warren Miller. "Natchez On-Top-of-the-Hill Historic District". National Park Service. Retrieved 2016-08-10. ^ "St. Mary Basilica, Natchez, Mississippi, USA". GCatholic.org. Retrieved 2016-08-10. ^ "Body of first bishop of Mississippi exhumed". Retrieved 2007-08-31. This article about a church or other Christian place of worship in Mississippi is a stub. You can help Wikipedia by expanding it.